Between 1958 and 1968, citizens in every Canadian province debated the pros and cons of medical services insurance. At the heart of the debate was the question of the role of government in health care. Was it to be the sole funder and chief administrator? What role was there for the medical profession? For the private insurance companies? For Trans-Canada Medical Plans?In a society that was split between those who wanted to see governments extend the benefits of the welfare state to all citizens and those who viewed government support as equivalent to communism, the debate over medicare was destined to be headline news throughout the decade. Saskatchewan led the push for publicly administered and funded medical insurance, while Alberta and Ontario restricted public funding to support for the indigent and those on low incomes. Elsewhere, Quebec was focusing on the development of its own approach to health and social services, while the Atlantic provinces were deeply concerned about their ability to afford the human and financial costs of expanded health care services. 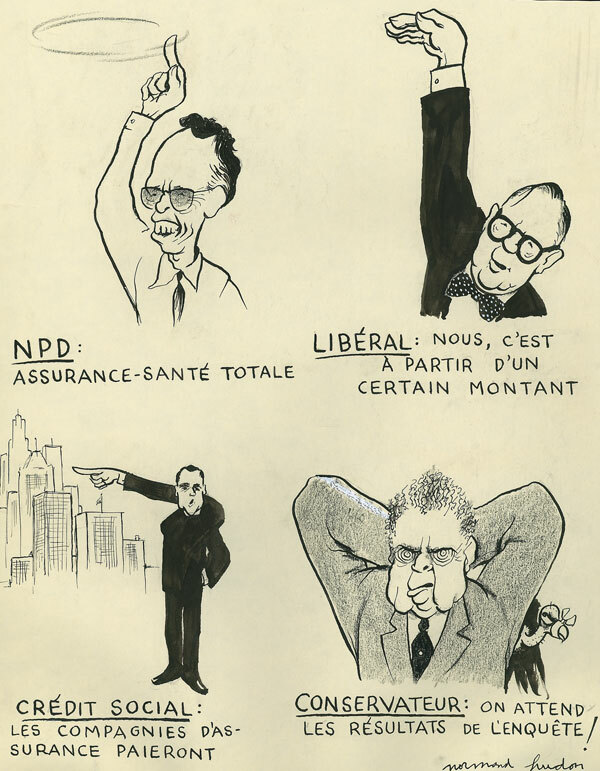 And between 1962 and 1968, the national political scene saw a series of minority Progressive Conservative and Liberal governments led by John Diefenbaker and Lester Pearson grapple with the modernization of Canadian society. The debate about medicare was a key component of that process. 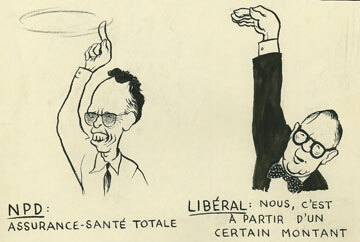 Normand Hudon’s drawing of the four party leaders just after the 1962 federal election shows their attitudes towards health insurance, ranging from Tommy Douglas’s comprehensive plan to Réal Caouette’s pointing to the insurance companies’ role. Conservative: We’re waiting for the results of the survey!